From rich cakes, to curious macarons, the food season is truly decadent. In every hotel lobby and confectionery window these days therea��s a riot of green, gold and red decorations. 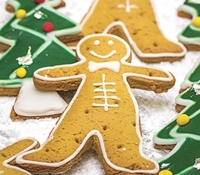 Alongside are tall star-spangled Christmas trees, chalets, and counters with tables groaning with Christmas goodies a�� from plum puddings and Christmas cakes to gingerbread cookies and cinnamon rolls a�� all there to tempt you into indulging your sweet tooth and igniting the spirit of the festive season. Oh yes, Christmas is around the corner. But with food trends and preferences changing faster than yesterdaya��s hashtags, I wondered if the yen for traditional baked Christmas confections have changed. Are people still going ho-ho-ho over traditional puddings and cakes? Or is there something new being added to the (spiced) mix? The Oberoia��s lobby was a-glitter with its pretty Christmas chalet, and pastry chef Bhuvan Ravishankar was busier than Santaa��s elves preparing a giant snow-clad mountain made of royal icing for their Polar Express themed Christmas, complete with a running toy train. As I pulled him away from his task, he said that while plum cakes and puddings were selling like hot, well, cakes, stollen is the new hit of the season. I have a weakness for stollen; the dense German sweet bread studded with marzipan, dried and candied fruit and nuts, brushed with melted butter and dusted with sugar is as Christmassy as you can get, and also as sinful as the wicked witch of the north. His favourite too, he agreed. Other hits include gooey-centred cookies, spelt, and other artisanal breads for canapA�s and sandwiches as well as plum pudding, steamed for nearly five hours, and served with brandy sauce or gingerbread ice-cream. a�?Christmas is all about spice-soaked ingredients a�� rich, lovely and special,a�? he said. Novotela��s pastry chef Vishal Sharma on the other hand believes traditional plum cakes and puddings should always be made the traditional way. However, this year he has let his imagination run wild with the very French macarons. Sharma has added unique desi flavours to make out-of-the-box combinations which would do Pierre HermA� proud. 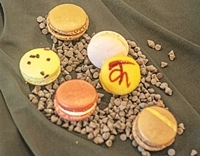 The macaron named katha is a melange of lachcha rabdi with amla ka murabba, while manna consists of tobacco-infused dark chocolate ganache with fennel. Kodava is a passionfruit buttercream macaron with a crackly praline centre, and finally the myrrh puts together the flavours of foie gras, aam papad and a hint of Kerala black pepper! 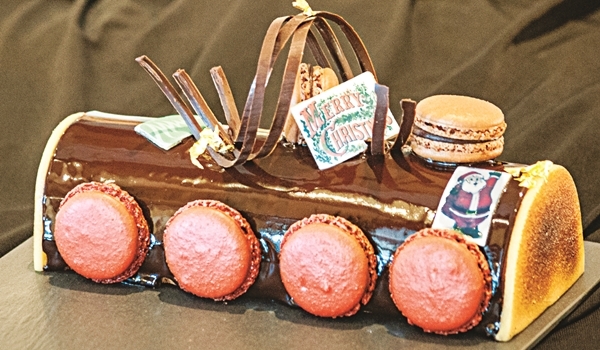 The macaron series took shape through plenty of trials (and a few errors), until they found the perfect blend of European flavours with favourite Indian treats a�� perfect for an Indian-accented Christmas treat. His Yule logs are quite different too a�� dark Belgian chocolate with meringue and pistachio. Oh my. When author Mary Ellen Chase said, a�?Christmas isna��t a date, ita��s a state of mind,a�? she probably meant a very sweet and indulgent one, Ia��d say.